We’ve been accepted to the Explorer Academy! I was fortunate to spend my Wednesday afternoon with a lovely group of fellow book-lovers; professors, lit experts, book-sellers, and publishing industry insiders (oh, my!) at the lunch and launch of the new National Geographic Kids series Explorer Academy. The series will include seven fact-based fiction adventures for middle-grade readers that are inspired by the real scientists and explorers at the National Geographic Society. The first title in the series, The Nebula Secret, follows 12-year old Cruz Coronado and his fellow students as they travel the globe to become the next generation of explorers and possibly solve the mysterious death of Cruz’s mother. The blend of adventure, STEM topics, and world cultures is sure to appeal to a wide audience. Trudi Trueit, the series author, is a weather forecaster turned writer that couldn’t help sharing her love for science with young readers. In our brief conversation, she proved to be a passionate advocate for readers, libraries, and scientists! She has tapped the knowledge of National Geographic Explorers (they are like the rock stars of the National Geographic Society) for the series to bring their real life discoveries, research, and innovations into the action-packed plots. Nizar Ibrahim, paleontologist and National Geographic Explorer, joined us to share his experiences with the NGS and a top-secret (sorry!) hint at some new discoveries. 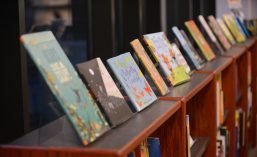 Stop by the BCLC to check out the ARC in our signed books collection (as soon as I finish reading it) and keep your eye out for publication this fall by Under the Stars, the new fiction imprint of National Geographic. This entry was posted in 3-4, 5-6, National Geographic, Uncategorized and tagged adventure, culture, science, STEM. Bookmark the permalink.